How to choose the right tires for your car, truck, suv? Tires are considered to be worn out at 2/32 inch minimum tread depth. In wet conditions 4/32 inch or less tread means a significant loss of wet traction due to shallower grooves and sipes. In snow conditions, traction noticeably diminishes at 6/32 inch tread depth. Shallower lug and groove depths limit a tire’s ability to “bite” into snow and clean out snow compressed into the tread. Irregular wear necessitates early tire replacement. Each year more car, light truck, and SUV designs are introduced. As a result, tire manufacturers are responding with more specialized designs. Be aware that for a given vehicle you can choose anything from long-wearing, easy-riding tires to style-conscious, ultra-high performance tires. It’s your call. We have many different types of tires to fit a wide range of vehicle styles and driving habits. The old adage, “you get what you pay for”, may have been invented for tire buying. A good exercise would be to calculate the total price for your tire purchase and divide that by the miles of service to get the cost per mile. You’ll quickly see that the better tires are the better value. When you have mileage guarantees to compare, this calculation is very easy, but there is another way. When you are comparing tires within a particular brand, use the UTQG (Uniform Tire Quality Grading) ratings (treadwear grade) to calculate value. Divide the tread wear rating by the price. The highest number should be your pick if you want the best value according to treadwear grade. This system won’t help you compare between brands, however, because there is no standardization for wear scoring. Traction and temperature ratings are standardized, however, and are useful for making comparisons between brands. If you need one tire (due to damage, a defect, irregular wear, etc.) 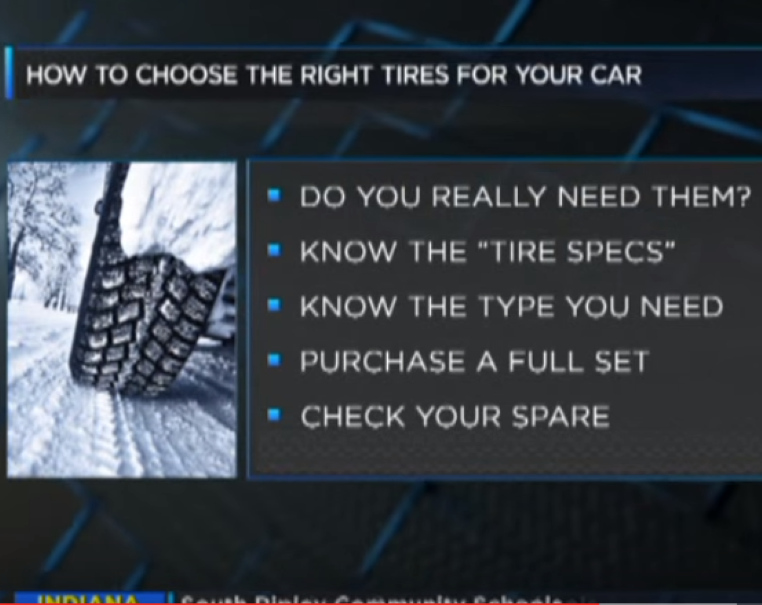 it is recommended that you replace it with a tire that has a similar brand, line, speed rating, and load capacity to your three remaining tires. If you need two tires due to poor or irregular wear, replace the tire with ones of similar or better quality. The two new tires should go on the rear of your vehicle. Replacing all four tires is the best case scenario, as you are open to a wide range of options. Most people replace their old tires with the same size that was on the vehicle. If this is your choice, there are various locations you can check to determine tire size.You can check the sidewall of the tire itself. You can also find this information in the owner’s manual for your vehicle. Finally, you can check your vehicle’s tire placard. The placard is often located inside the glove box door, fuel door, doorpost, or door edge of your vehicle. If you know the tire size you need, use our Search by Sizeoption to see what we have available. By selecting a tire of the next lower profile, you can significantly improve the ride quality and handling of your vehicle. On small cars, a good example is to replace the original equipment 155/80R-13 size with 175/70R-13. The tread is almost an inch wider and the tire has a proportionately lower sidewall (however the tire’s height remains the same). Both of these features improve handling and stability. Use our Find Tire Size by Vehicle search to see these options. Plus sizing has become very popular. In this application, the plus size tire is the same height as the original but its sidewalls are shorter. This change delivers improvement in tire response and handling. Use our Find Tire Size by Vehiclesearch to see these options. Verify that the rim width range is appropriate for the tire to be installed. Confirm that the tire-to-vehicle clearance, lock-to-lock steering and suspension clearance is such that no rubbing occurs. A person who lives in southern California will often choose a significantly different tire for their car than someone who lives in Minnesota. There are exceptions to the rule, however. The person who lives in California may go on a skiing or off-roading trip. The person in Minnesota may only drive on plowed roads during snow season. Therefore, their driving situations may include a variety of conditions. Analyze your average driving conditions to determine if you most frequently drive on dry roads, a combination of both wet and dry roads, or primarily wet roads. Then, factor in the possibility of seasonal extremes. Most tires purchased today are the all-season type that appeal to the great majority of drivers who seek acceptable performance and traction across the spectrum of possible driving conditions in all four seasons. Look for the M&S symbol on the sidewall to ensure the tire’s mud and snow rating for winter use. Consider seasonal tires. All-season tires have performance and traction disadvantages since their design elements are averaged. In the fast-growing performance market segment, two newer strategies have become popular. In non-snow climates, summer or dry type designs are emerging as year-round favorites. These designs feature far superior dry handling and traction with wet performance ranging from acceptable to excellent. Performance enthusiasts who live in more extreme winter climates also use these new designs when seasons allow and change over to winter tires once the snow begins to fall. If you drive a pickup truck or SUV, chances are you’ll be considering a purpose-built tire design to match your driving needs. These designs have tradeoffs including traction (both on and off the road for various conditions), highway ride quality, and performance. In terms of traction, designs range from HT (highway tread) to AP (all-purpose) to AT (all-terrain) to MT (mud terrain) in order of aggressive tread design. Highway ride quality diminishes as the tread design becomes more aggressive. You can pick tread aggressiveness according to your needs, but be mindful of the highway ride quality tradeoff. Most SUV owners select AP type tires for their balanced highway ride and all-season traction. Sport truck tires with all-season tread designs are quickly gaining popularity among SUV owners, however. These drivers are looking for better handling when on the highway and are willing to settle for less traction off-road. Meanwhile, pickup truck owners continue to sustain their “purpose-oriented” tire selection, with AT tires remaining the most popular type in this market segment. However, Sport truck tires are showing gains among those who like great highway handling and need a tire that can handle truck load capacities. Most people are aware of speed ratings. Simply put, you need to buy a tire with the appropriate speed rating for your vehicle. In Europe, the law mandates that the original equipment tire must be replaced with a tire possessing the same or higher speed rating. However, in the US you can buy a lower (and less expensive) speed rated tire of the same size. If you do this, be aware that you are limiting your vehicle’s performance in terms of handling and speed capacity. Generally speaking, a tire’s handling response corresponds with its speed rating. Look at it this way: you’ll lose that crisp handling the manufacturer designed into the vehicle and you will not be able to safely achieve the speeds the vehicle was designed for if you use a lower speed rated tire than the original design. Conversely, you can improve your vehicle’s handling with a higher speed rated tire.